“Cove Grove,” plantation house of Benjamin Smith Skinner, Perquimans County, North Carolina, photo by Elizabeth Matheson. Left. Joseph Blount Skinner, 1825 oil portrait by Thomas Sully, Ackland Art Museum, Chapel Hill, North Carolina. Second from left. 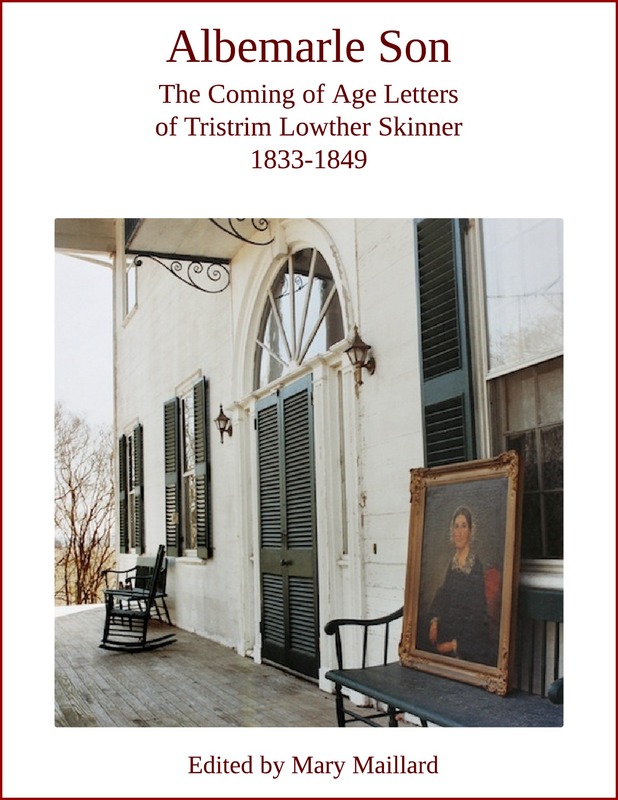 Tristrim Lowther Skinner, the Skinner Sosnowski family, Charleston, South Carolina. Third from left. “For We Can Love No More,” parlour music owned by Eliza Fisk Harwood, courtesy Elizabeth Matheson. Right. Eliza Fisk Harwood, Skinner family. Godey’s Lady’s Book, December 1840. “Palace Green,” Williamsburg, Virginia, 1834 watercolour by Thomas Millington. Swem Library, College of William and Mary, Williamsburg, Virginia. Portrait of Thomas Harvey Skinner, oil on canvas 76″ x 44″, attributed to Samuel F. B. Morse, 1852. Presbyterian Historical Society, Philadelphia (call number 1287). “Going Out,” on Albemarle Sound, David Hunter Strother, North Carolina Illustrated, Harper’s New Monthly Magazine, 1857. “Hauling the Seine,” at Belvidere fishery, David Hunter Strother, North Carolina Illustrated, Harper’s New Monthly Magazine, 1857. “Night Haul,” David Hunter Strother, North Carolina Illustrated, Harper’s New Monthly Magazine, 1857. The “A” on Tristrim Lowther Skinner’s belt stood for “Albemarle Guards.” Photo by Mark Banka, courtesy Frances Drane Inglis. Portrait of Misses Mary and Emily McEuen, 1823, by Thomas Sully, from America: Painting A Nation. Stack of old letters (untitled), Sally Mankus, http://sallymankus.com. Tristrim Lowther Skinner to Joseph Blount Skinner, January 16, 1840. View of Williamsburg’s Palace Green, watercolor by Thomas Millington, 1834. Special Collections Research Center, Swem Library, College of William and Mary. Penelope Skinner to Tristrim Lowther Skinner, January 31, 1840. Godey’s Lady’s Book, December 1840. 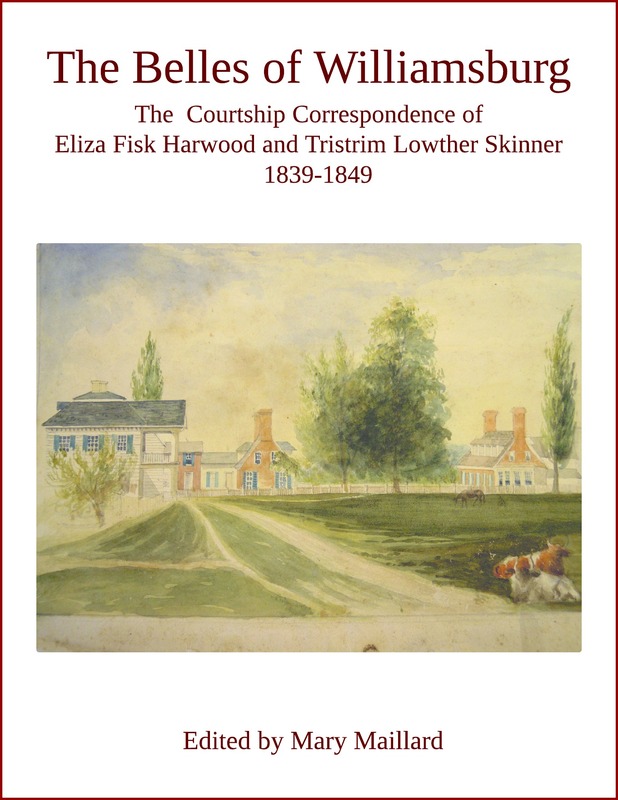 Eliza Fisk Harwood to Tristrim Lowther Skinner, April 5, 1841. Graham’s Magazine January 1841 from “The Literate Quilter,” http://theliteratequilter.blogspot.ca/2013/09/1841-grahams-ladys-and-gentlemans.html. Tazewell Hall Page Header. Architectural drawing of Tazewell Hall as it looked in the 18th century when it was built by “Tory” John Randolph. Colonial Williamsburg Digital Library. Tristrim Lowther Skinner to Joseph Blount Skinner, from Baltimore, May 3, 1844 View of Baltimore, 1839, engraved by S. Fisher after a picture by William Henry Bartlett. Tristrim Lowther Skinner to Eliza Fisk Harwood, from Boston, September 8, 1845. Binney Monument, James Smillie drawing from Mount Auburn Illustrated, 1847. Letter from Cuba, Dickie Galt to Eliza Fisk Skinner, January 6, 1851. Coachmen in Havana, 1851, Federico Mialhe. 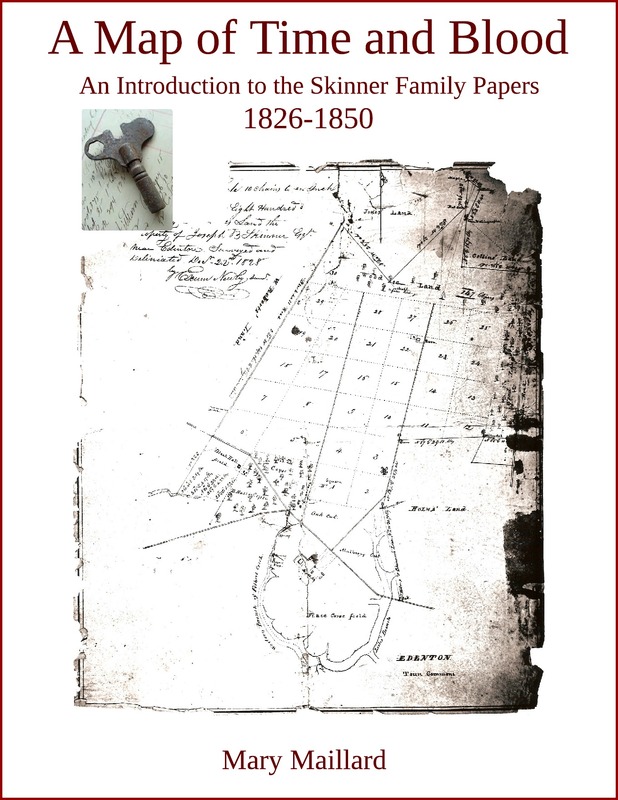 Special Collections, University of Virginia. Tristrim Lowther Skinner to Eliza Fisk Harwood, June 5, 1862. Left panel of header, Harrriet Ryan Benbury (wife of John Avery Benbury), North Carolina Portrait Collection, University of North Carolina. Center panel of header, display of 1861 daguerreotype of Tristrim Lowther Skinner flanked by the Benbury brothers, John A. and Lemuel C., courtesy of Frances Drane Inglis; shoulder stripes belonging to Tristrim Lowther Skinner; courtesy Rebecca Drane Warren; photo by Mark Banka. Right panel of header. Daguerreotype of Tristrim and Eliza Skinner’s children, 1859: Marian (5), Tristrim Jr. (1), and Frederick (3), courtesy of Frances D. Inglis. Joseph Blount Skinner, oil portrait by C.C. Fenn, courtesy Thomas W. Skinner. Eliza Fisk Harwood, oil portrait, artist unknown, courtesy Rev. 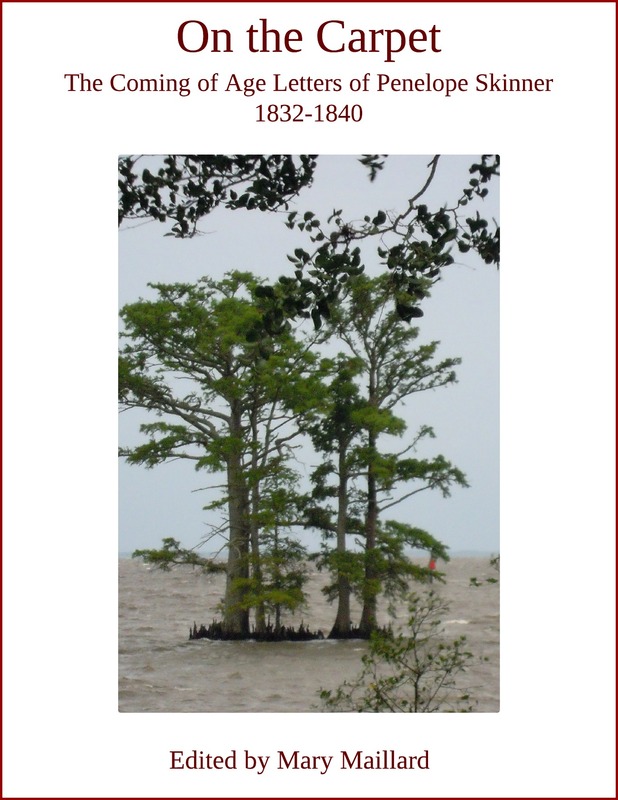 H. Warren Blakeman, West Monroe, Louisiana. Eliza Fisk Harwood’s mended silk stocking c1840-1848, marked on the top edge in India ink with her name, “Eliza Fisk H.” Photo Mary Maillard, courtesy Susan Inglis. Tazewell Hall engraving, Colonial Williamsburg. Tristrim Skinner’s Civil War saddle bag, photo by Mark Banka, courtesy Frances Drane Inglis. “Fair Oaks after the battle, burying the dead – and burning the horses. Tuesday 3rd June,” drawing by Alfred R. Waud, Library of Congress. “The Chickahominy – Sumner’s Upper Bridge,” William McIlvaine, 1862, Library of Congress. Tristrim Lowther Skinner’s shoulder stripes. Photo Mark Banka, courtesy Rebecca Drane Warren. Joseph Blount Skinner House, Edenton, North Carolina, photo by Mary Maillard. President John Tyler, portrait by George Peter Alexander Healy, painted 1859-1864, hanging in the Blue Room at the White House. Anthony Kennedy. View of Baltimore, engraved by S. Fisher American Scenery, c1840. The steamer Isabel, Edward McGregor, 1848, the Maryland Historical Society in “A Portion of the People: Three Hundred Years of Southern Jewish Life,” University of North Carolina online exhibition, 2006. The Great Gust of 1846 page header, “Ship in a Stormy Sea off the Coast,” Ivan Constantinovich Aivazovsky, 1895. Lalla Rookh by Thomas Moore, 1861, Longman Greens, London.